Monday, July 6, marks the second anniversary of the tragic Lac Mégantic, Quebec, oil train catastrophe that killed 47 people in 2013. Despite dozens of almost as horrifying, fiery disasters over the last two years, the oil industry continues to dramatically expand Alberta tar sands and Bakken crude oil train transport throughout Canada and the United States. There is no safe way to transport such explosive oil and, with carbon and associated toxic pollution rising, oil trains wreck public and environmental health and safety and the global climate of communities across the continent. The tragic Lac Mégantic accident grimly reminds us all that Big Oil will stop at nothing to extract, transport, and burn every drop of oil in the ground. Its primary northern Idaho/eastern Washington haulers, Burlington Northern Santa Fe Railway (BNSF) carrying fracked Bakken shale oil and Union Pacific Railroad moving Alberta tar sands dilbit through the Sandpoint, Idaho, and Spokane, Washington, areas, discount the communities they transgress with hazardous loads. Recent, industry-friendly, federal regulation revisions will not check their recklessness. The risks, costs, and millions of lives within the mile-wide, bomb train blast zones along their paths to profit around the Pacific Rim represent only collateral damage to the oil and railroad industries. In July 2014, thousands of concerned citizens gathered at 63 events for the first Stop Oil Trains Week of Action, including multiple protest and outreach actions in Sandpoint and Spokane . As Wild Idaho Rising Tide (WIRT) and allies continue to actively oppose Alberta tar sands and Bakken shale oil exploitation and train and pipeline transportation, we refuse to let Big Oil play Russian roulette with our families, friends, homes, businesses, and climate! On July 6 to 12, 2015, people across North America are defending their communities and climate, to halt extreme energy in its tracks and end the oil and rail industries’ pipeline on wheels . We will call attention to the growing threat of oil trains, as we demonstrate the growing power of our movement, organizing more than 100 events across the U.S. and Canada, which demand an immediate ban on oil trains. Please join WIRT and allies at local demonstrations during the Stop Oil Trains Week of Action, and/or host or attend an event in your vicinity between July 6 and 12. Together with climate, environmental, and social justice activists across North America, we are organizing various tactics and resources to stage powerful and effective actions and documenting them with photos, videos, audio, and social media, to defend and protect frontline, rail corridor communities and our shared climate. Stand with residents of Lac Mégantic and other communities in the crosshairs of Big Oil, to stop oil trains this July, by participating in one or all of these five actions. On the July 6 Lac Mégantic bomb train disaster second anniversary, the Climate Justice Forum radio program hosted by Wild Idaho Rising Tide gratefully welcomes Sightline Institute policy director Eric de Place. As the keynote speaker of the educational panel presentations and discussions on oil and coal transport and export held in Spokane and Sandpoint on June 23 and 24 and recently throughout the Northwest, Eric will talk about increasing fossil fuel rail traffic and proposals for new and expanding facilities across the region. Broadcast on progressive, volunteer, community station KRFP Radio Free Moscow every Monday between 7:30 and 9:30 pm PDT, live at 90.3 FM and online, the show covers continent-wide climate activism and community opposition to dirty energy projects, thanks to the generous, anonymous listener who adopted program host Helen Yost as her KRFP DJ . Bring your friends, family, neighbors, co-workers, spirit of resistance, and protest signs, and honor the 47 residents lost in the July 6, 2013 Lac Mégantic, Quebec, oil train tragedy. Meet us at 8 pm on Friday evening, July 10, in or near the parking lot beside Evans Brothers Coffee Roasters, 524 Church Street in Sandpoint, for a 15-minute light projection of social and climate justice messages onto the nearby grain silos. After this light show, we will move to the corner of North Fifth Avenue/U.S. Highway 2 and Cedar Street, for a candlelit solidarity vigil, commemorating the all-species victims of oil train derailments, explosions, and fires, and another, brief, light message projection session from an undisclosed location. Between 9 am and 3 pm on Saturday, July 11, WIRT activists and concerned area citizens will visit with passersby and distribute informational flyers and material about oil trains and facilities, while marking the one-mile-wide, oil train blast zone with chalk and posters in downtown Sandpoint . Find us outside the Farmers’ Market at Sandpoint, from 9 am to 1 pm near Farmin Park at Third Avenue and Oak Street, and/or on the Bridge Street bridge, enjoying the canoe, kayak, and paddleboard races of the Great Sandpoint Flatwater Regatta starting at 10 am in Sand Creek, and/or along the Sandpoint Boardwalk and Marina in downtown Sandpoint, observing the annual Parade of Boats on Sand Creek and the Antique and Classic Boat Show between 10 am until 3 pm. At 12 noon on Saturday, July 11, WIRT and allies will stage a marching rally, mobilizing the Sandpoint community to protest oil trains. Both BNSF and Union Pacific are implementing and proposing major infrastructure changes at and around the Sandpoint “funnel” rail bottleneck. BNSF plans to build a second rail bridge over Lake Pend Oreille, north of the present bridge and visible from Sandpoint City Beach Park, to accommodate the reckless endangerment imposed by the current 16 to 19 mile-long unit trains transporting highly volatile crude oil through the region every week and additional such trains and their impacts in the future [5, 6]. We will march from the clock at Farmin Park, up North Third Avenue to Cedar Street, following it to Bridge Street and City Beach. At our destination in the park, we will perform a creative, public theater protest, highlighting the park’s isolated vulnerability if a bomb train ever exploded near downtown Sandpoint. 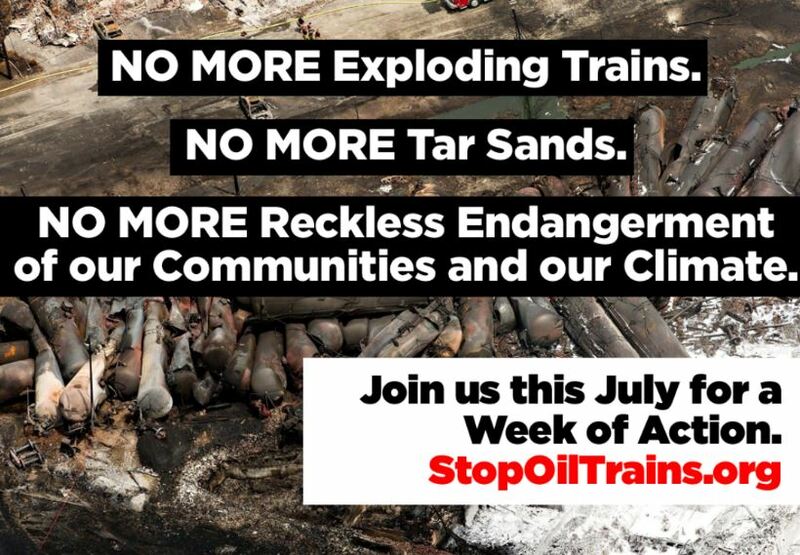 Join the Stop Oil Trains Week of Action! We need each of you by our sides during this week of continent-wide actions, as the people of Lac Mégantic urge everyone’s participation [7, 8]. Gather with us on Friday and Saturday, June 10 and 11, to engage and involve more community members in demanding an immediate ban on oil trains. Please RSVP to let us know that you will be helping these actions, by responding to WIRT through the enclosed contact channels or by signing up through the constantly updated Action Network interactive map link to the WIRT event page . We welcome your questions and suggestions about these events, as we thank each of the Sandpoint and Spokane area WIRT activists and allies who have provided invaluable information, connections, ideas, action design, and on-the-ground support for the Sandpoint Stops Oil Trains Week of Action! PLEASE JOIN US THIS WEEKEND!